So behind the scenes I've been beavering away on my Farmer's Wife Blocks...this is officially my longest work in progress and boy have I learnt A LOT since I started. Where possible I've used quilty maths and where the maths has had me flummoxed I've used the templates contained on the disc in the back of the book. Today I'm joining Kerry to share Block #64 Monette. I swing between the traditional layout from the first book and the chevron layout of the second book.....I was completely swooning over the chevrons when I first saw them, but there is something equally gorgeous over the sashing with cornerstones....oh and do not mention the other layouts that I drool over when searching through the hashtag #fwqal on Instagram! 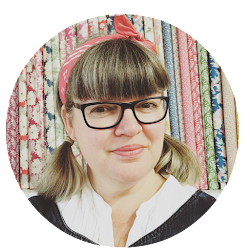 Don't forget to pop over to Kerry's Blog to see her version of Monette, she has been sharing some amazing information and top tips and you should see all her other blocks, they're stunning! Good tip with the strip piecing/squares, gorgeous fabric selection too although I expect nothing less!